Dell launched revamped 2011 versions of their XPS laptops in India. As you all might know, Dell XPS series includes high-end laptops with latest processors and technologies. The new XPS range has a refreshing look and the best hardware available in the market. 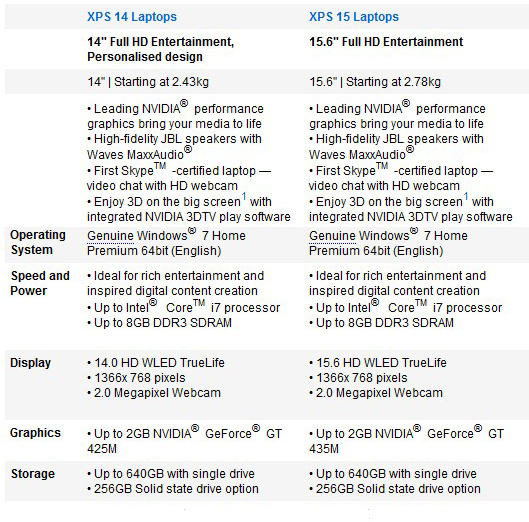 Most of the Studio XPS models were pulled out from Dell online store, and they will be replaced with XPS 15, XPS 14 and XPS 17 laptops. Like in the Dell R series, each XPS model got its name from the screen size. All the machines support DDR3 memory up-to 8GB and latest NVIDIA graphics card with up-to 2GB video memory. They can be customized with Core i3, Core i5 or core i7 processors with a maximum clock speed of 3.2 GHz, and 3MB-8MB cache options. The 2011 Dell XPS range comes with Silver Anodized Aluminum back cover and that is extended towards sides and under the keyboard. Its gives a solid matte finish to the machine and protection against fingerprints and dirt. Dell XPS 15, 14 and 17 inch models have JBL speakers on two sides of the keyboard which along with MaxxAudio 3 sound processing technology – and it gives out crystal clear sound. There is also a 12W JBL sub woofer for better bass reproduction. The display and video rendering is another plus point of the new XPS 2011 series. There is an option to choose from 14, 15 or 17 inch high clarity HD WLED monitors. Dell XPS 14, XPS 14 and X17 uses the latest NVIDIA GT mobile graphics chips with NVIDIA performance graphics and NVIDIA Optimus technology. The NVIDIA 3D play software included in the package lets you play 3D games, watch 3D Blue-ray movies when used with an external HD hardware. 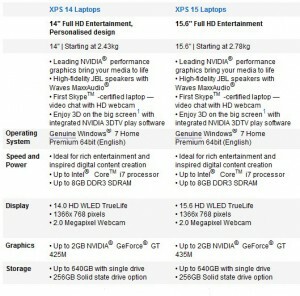 Dell XPS 14, 15 and 17 models include an HD cam that supports 720p video calls through Skype, Yahoo and other software. These are the prices in India for the base model, and it may change further based on configuration chosen at the Dell store.